A clean treat. Yes, clean and SO DAMN GOOD. Yes, I had chocolate at breakfast, yes I am having more chocolate before bed (and peanut butter of course). 1. Blend Chickpeas with protein powder, honey, peanut butter and almond milk. It should be thick, sticky, and scoopable (add/adjust almond milk/chickpeas as necessary for texture). 2. Melt dark chocolate chips with coconut oil (I ended up melting more chocolate for maximum flavor coverage). 3. Pour a thin layer of the chocolate into parchment-lined muffin tins. 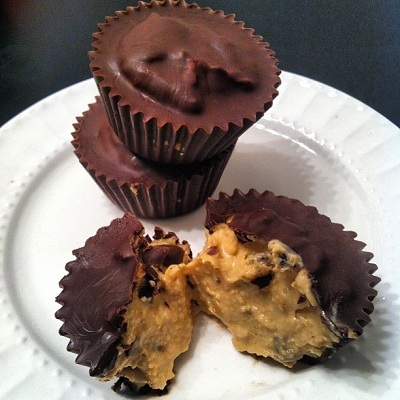 Scoop about 2-3 T of the peanut butter mixture into each, then top with more chocolate. I only made 4, but I made them HUGE. More flavor circumference for the taste buds. Plop them in the freezer (freezing time will depend on patience level...I did 30 minutes., but should of waited longer but couldn't).